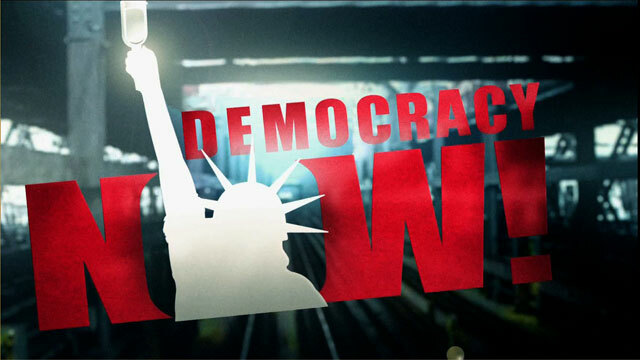 Ex-CEO of Worker-Occupied Chicago Window Factory Arrested on Fraud Charges | Democracy Now! staff writer at the Washington Post and author of Revolt on Goose Island: The Chicago Factory Takeover, and What It Says About the Economic Crisis. JUAN GONZALEZ: One of the most closely watched US labor struggles in recent memory has taken a surprising turn. Nine months ago, 200 workers at Chicago’s Republic Windows and Doors occupied the factory for nine days after the factory owners gave workers just three days’ notice of the plant’s closure. The plant closed after Bank of America cut off its line — the company’s line of credit. The protest, organized by the United Electrical Workers union, was one of the first US factory sit-ins since the 1930s. The factory was later bought by another company, and some of the workers involved in the takeover have returned to their jobs. Republic Windows and Doors is back in the news this week. Its former chief executive, Richard Gillman, has been arrested and is being held on $10 million bond. Gillman is accused of conspiring to launder funds from the factory and secretly remove its equipment to a new operation in Iowa. The alleged offenses came around the time Gillman abruptly ordered the factory’s closing to sell it to another company. AMY GOODMAN: The factory takeover at the Republic Windows and Doors may also receive more attention in the coming weeks thanks to filmmaker Michael Moore. His new documentary Capitalism: A Love Story highlights the factory sit-in as an example of how laid-off workers can fight back. But to talk more about this story today, we’re joined by journalist Kari Lydersen. She’s a staff writer at the Washington Post and author of the new book Revolt on Goose Island: The Chicago Factory Takeover, and What It Says About the Economic Crisis. First come comment on Gillman, his arrest, being held on $10 million bond. AMY GOODMAN: What did he do? KARI LYDERSEN: He basically set up -— him and also a number of associates set up a number of shell companies, different window and construction companies, that they were essentially laundering money through. And it turns out the charges describe how they actually hired a consultant in April that was helping them try to get out of this financial mess that Republic Windows and Doors were in. And one of the things they explicitly were actually trying to do — this isn’t, you know, necessarily part of the criminal charges, but the charges mention that they were trying to break the union. The consultant talked about it being a militant and a maverick union that they wanted to get rid of. And that was part of the whole reason that they were moving the equipment, which they didn’t actually own, to this Iowa plant, literally under cover of night. That’s part of the robbery charges. There were also money laundering, mail fraud, fraud charges. AMY GOODMAN: It’s interesting, in the Wall Street Journal, it said, “Prosecutors said in the filing […] they were able to build their case, in part, because workers at the factory prevented Mr. Gillman and others from re-entering their offices. KARI LYDERSEN: Yeah, and that’s — you know, these charges against Gillman probably wouldn’t have reached this level, or maybe there wouldn’t have been charges at all, if it wasn’t for the union, for the workers’ activism. So that’s — you know, that’s another big part of the story. JUAN GONZALEZ: Yeah, one of the things in your book, you go into the history or the years before the sit-in. And clearly, you show that a lot of the antagonism developed because there had been a prior company union, as it’s called, and that UE had actually come in only a few years before the attempt to close it. Could you talk a little bit about that? KARI LYDERSEN: Sure, yeah. And, I mean, you know, one of the things that makes this story so interesting is all the Chicago contacts. And so, this — the workers at this company previously were represented by the Central States Joint Board, which was a very notorious, at least at the time, Mob-aligned union. There were all sorts of federal charges and investigations, you know, about the goings-on at that union. So it was a real battle. A lot of the workers didn’t even know they had a union, because it was so company-aligned. And they ended up getting connected with the UE through, you know, sort of a network of immigrant and labor rights structures in Chicago. And it was a real battle to bring that union in, to bring the UE in, and get rid of the Central States Joint Board, and then also to get their first contract. So a lot of the groundwork for the sit-in was kind of laid, you know, with this original struggle to actually get the UE and then also kind of building upon, you know, a lot of the workers’ history in Latin America of more — sort of more militant labor. AMY GOODMAN: Kari Lydersen, can you talk about the history of UE, United Electrical Workers? KARI LYDERSEN: Sure. And that’s one of the things that also makes this story so special and one of the things that was really interesting to me in writing the book. The UE, you know, is known as one of the more progressive unions and was one of the founding members of the CIO and then had to basically leave the CIO sixty years ago, just right before they probably would have been purged as part of sort of anti-communist purges. And then the union, you know, really suffered because of anti-communist hysteria and everything in the ’50s, but they survived and kept kind of slowly rebuilding and keeping a base in their traditional skill trades, but then also organizing different — and probably largely because of their progressive politics — scientists, different, you know, nontraditional union constituencies. And the UE has always really been willing — especially in recent years, as mainstream labor has gotten a lot more conservative and company-aligned, UE has been a lot more willing to still go out on a limb and use creative tactics. And, you know, that’s very much why it was the UE that took on this struggle and was willing to break the law and, you know, to do something that we haven’t seen very often at all in recent decades. JUAN GONZALEZ: One of the other things you point out is that contrary, I guess, to most beliefs in the initial press reports that this was a sort of a spontaneous action of the workers, they actually planned this for about a month beforehand, once they realized what they thought the company was doing, that they were actually meeting and planning to attempt to take over the factory or occupy it if there was a final decision of the owners, and even that the — some of the union leaders consulted with Canadian union members who had been involved in factory takeovers in Canada previously, to sort of get tips about how to do the occupation properly? KARI LYDERSEN: Yeah, exactly. And that’s one of — also, when I started researching it, you know, just getting deeper into the story, one of the things that I thought was really significant. I mean, the media coverage was saying, you know, these workers were shocked to hear their factory was closing, and they just refused to leave, which was a dramatic story, but the reality, you know, is much more significant. And that is, like you said, they knew something was going on, because the equipment was disappearing, and so they were strategizing. And the workers, you know, were willing to really do whatever it took. I mean, they had even some more radical ideas in their brainstorming sessions than the occupation. And so, it’s sort of a combination of the workers’, you know, willingness to really go out there and then the UE’s kind of long-term strategy and meeting with the Canadian autoworkers, who had had some successful factory occupations just in recent years, in the past five years. So they were fully ready, you know, when this all went down. And, I mean, a lot of it — sometimes it kind of reminds me of the whole Rosa Parks struggle, you know, something that was sort of framed as a spontaneous action, but was really much more significant, understanding the full context, where it was very strategic and very planned out. AMY GOODMAN: Talk about how the sit-down, how the sit-in actually occurred. In this Wall Street Journal piece that lays out the filing, it talks about one of the documents that they got as a result of the workers not allowing Gillman and the others to return to work and get their PowerPoint presentations that laid out how the conspirators sought to “remove, conceal and convert collateralized manufacturing equipment without the consent of Republic’s creditors.” But how it actually played out on the ground, the closing, the reopening? KARI LYDERSEN: Mm-hmm. Yeah, I mean, in some ways, it looked — it was not a combative situation, because part of the — the interesting part of the story is, all the local politicians and the Chicago police were really on the workers’ side from day one. So it was not the kind of thing where people were being — you know, might have been dragged out or there might have been violence. I mean, really, pretty much everyone, except the company ownership, you know, supported the workers. So it was actually a very celebratory sort of atmosphere there. And, I mean, no one from the company was anywhere to be seen after the first couple hours it started. The plant actually closed on a Friday afternoon, and that’s when the workers refused to leave and just stayed in there. And they had already laid all the groundwork, you know, with local officials and with the police to sort of be supportive or at least be hands-off. So management, you know, either holed up in the office or were just absent, and it really was taken over by the workers and the community. JUAN GONZALEZ: —- before he was arrested, because the next day after he stands in front of the factory to support the workers, he ends up getting indicted on his own corruption charges, so that there was sort of work that had been done beforehand by the union and the workers, again, with the politicians, as well. KARI LYDERSEN: Oh, positively. I mean, Gutierrez and some other politicians were — you know, played big roles in developing the whole strategy. And then it really just tapped into a whole network of immigrants’ rights groups and, you know, pro-immigrant politicians, and labor, obviously, is very strong, historic labor movement in Chicago. So all these things were sort of ready to help make this possible. AMY GOODMAN: And you have the quote of Barack Obama himself on the cover of Revolt on Goose Island, your book, saying, “I think they’re absolutely right…What’s happening to them is reflective of what’s happening across this [economy].” Why did you call it Revolt on Goose Island? KARI LYDERSEN: Well, for one thing, it literally is an island. It’s an island in the Chicago River that has a neat little labor history of its own. So that’s Goose Island. KARI LYDERSEN: Well, it was a, I mean, like I said, island in the Chicago River. And it was a lot of tanneries and some other industry in the 1800s. And, I mean, now downtown Chicago, you know, is mostly residential, very, you know, ritzy downtown city. But Goose Island still is industry, and actually there’s plans and city programs to try to make it kind of a green jobs hub, which the current situation of what used to be Republic Windows really plays into that, too. And then revolt — it was, you know, revolting. AMY GOODMAN: So, right now, you’ve got, what, fifteen workers who have gone back to work. Who owns it? What is happening now? KARI LYDERSEN: Yeah, so the workers, after the occupation, they did — I mean, the occupation succeeded in the sense that they got close to $2 million to pay the severance pay and vacation pay that was owed them from Bank of America and JPMorgan Chase, but the workers still wanted to keep their jobs and keep the plant open. And they tried to, and they were in the process, actually, of raising some significant funds to try to run it as a worker-owned co-op. But in the meantime, this California company called Serious Materials, which makes green building components, drywall and highly energy-efficient windows mainly, heard about the struggle because of the occupation and all the attention, and they had been looking for a Midwest location. They had actually, around the same time, bought a closing Pennsylvania factory and reopened it. So they entered negotiations to buy the factory. That was a difficult process in itself, because Bank of America, as the major creditor, wasn’t necessarily open to that. But they did eventually work it out. So, Serious Materials bought the factory. And actually, Biden was there in the spring. The administration has, you know, kind of been trumpeting Serious Materials as sort of a poster child of the stimulus and green jobs. And it’s now open. A lot fewer workers than they had hoped by this point have been hired back, but they have promised to hire all the workers back and to respect past seniority. And, you know, they have a new contract with the union. And they’re hoping to really benefit from the weatherization incentives in the stimulus. So that’s where it stands now. JUAN GONZALEZ: And in terms of the impact of this struggle on the rest of organized labor and the labor movement? KARI LYDERSEN: Yeah, I mean, I think at the time there was so much euphoria. You know, people had maybe visions of everything would be different now. And obviously that hasn’t happened. But there definitely have been very concrete ripple effects. I mean, right now the UE, along with Jobs with Justice, has a national campaign targeting Wells Fargo, sort of using the same strategy that they used against Bank of America. This company, this bank, got many billions in taxpayer money, so they have a responsibility to help preserve jobs and small businesses. There was a company that actually closed two weeks ago that was a very parallel situation to Republic Windows but wasn’t a success like Republic Windows, also represented by the UE. So there have been a number of worker direct actions or civil disobediences in the Midwest and around the country that were very directly inspired by Republic Windows. They haven’t necessarily all succeeded, but I think there has been a very identifiable, you know, increase in motivation for direct action or just for more sort of creative and strategic tactics, you know, since the Republic Windows occupation. AMY GOODMAN: Well, we want to thank you very much for being with us, Kari Lydersen, staff writer at the Washington Post, author of Revolt on Goose Island: The Chicago Factory Takeover, and What It Says About the Economic Crisis.